The new races and subclasses are all pretty fun and inventive, including tempered gnolls and humanoid spiders (which are way cooler than ettercaps), though none are as wildly unique and interesting as the Clonn. The entire first chapter is devoted to the Clonn. They are given a detailed history, notes on their government, religions and deities, and five new player backgrounds that range from rodeo clowns to devotees of the The Gathering of Galos. Yes, that’s a hilariously serious reference to juggalos, and I love it. 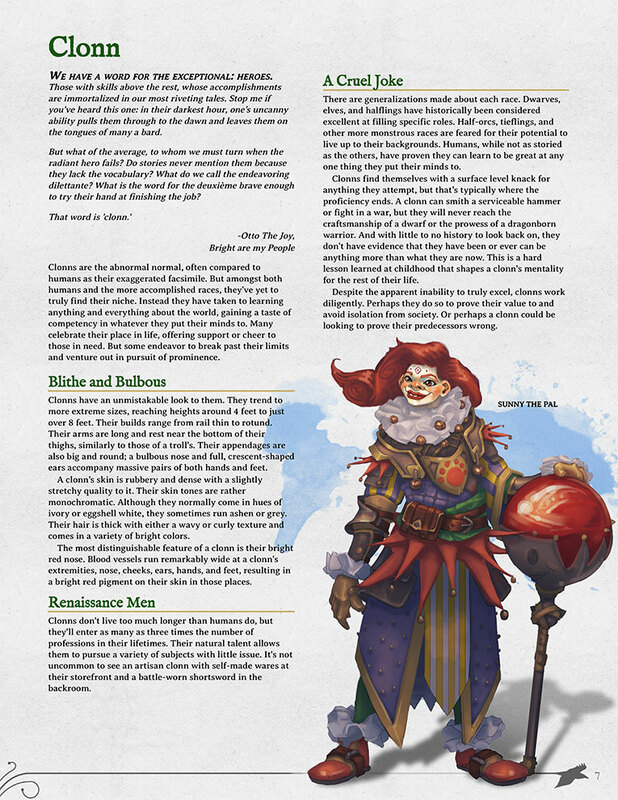 Most of the subclasses do a great job bringing fun new ideas and powers to their archetypes, such as the Mind Trapper Ranger, who plants several different triggerable effects on opponents, or the College of Culinary Bard, who can prepare different meals and ingredients to bestow useful and powerful buffs for their allies. The Merchant Rogue can even spend GP to gain advantage, which definitely seems hilariously abusable, even with the increasing cost. The only one that fell a bit short for me was the Residual Magic Sorcerer, which feels like a lame mixing of Wizard and Sorcerer. Keep your bookish wizarding out of my sorcerers! 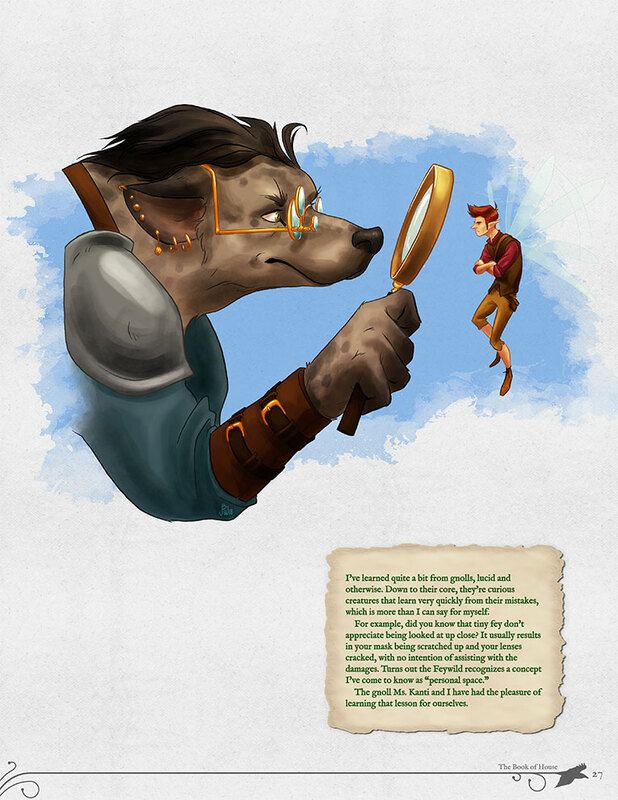 It’s a shame the lycanthropy section isn’t also sold separately, as it’s every bit as interesting and well-detailed as any of the races or subclasses. Not only are we given crazy cool new were-forms like weresharks, weresquids, and werewasps (oh my! ), but also more properly balanced player race options. The Monster Manual did a bad job trying to create firm rules for PCs afflicted with lycanthropy. On the surface it’s an incredibly powerful boost with little drawback. The new feral regression table proposed here is a good solution, though one I would personally modify to suit my and my players’ tastes. I also liked that each were-form comes with both an increase and decrease to ability score modifiers, making it more of an adjustment rather than a straight power buff. Even then it correctly warns that infecting a low-level PC could be very unbalancing. The third chapter covers everything else, including new spells, magic items, additional combat actions and a few legendary boss monsters based on the new races. The magic items in particular are flavor and fun, and well-themed to the Clonn race, like the magical spear umbrella, a dimensional zipper, and a fearful crown of bones. The additional combat actions are the weakest part of the book. They’re a bit too fiddly and remind me of the many, many feats in older editions of D&D, and Pathfinder. I definitely encourage players to do things other than just trade attacks in combat, and when they do I assign a skill check as needed, rather than a -5 to attack rolls to push someone. I think 5E does a good job already at giving every class plenty of options during combat, even if they don’t think outside the box. I was very impressed with the presentation level and professionalism of “The Book of House,” including an actual press kit! It’s well detailed, organized, and written, and the character artwork is some of the best I’ve seen at the DMs Guild. Not every section or addition is a winner but it’s a very impressive and comprehensive supplement overall. Five new subclasses and four player races, including a very detailed explanation of the Clonn race (along with five Clonn-specific Backgrounds). Fantastic, colorful, and plentiful character artwork throughout the entire document. New lycanthrope options and rules for PC lycanthropes. 10 fun new magic items, each with its own art. Three interesting boss monsters based on the new races. Can purchase any of the races or subclass options separately a la carte. New combat actions feel overly fiddly for 5e. The wizard-lite Sorcerer subclass is pretty lame. Cannot purchase lycanthrope content separately. The Verdict: “The Book of House” presents silly concepts like a race of clowns, butler bodyguards, and Culinary war-chefs and presents them with serious attention to detail, well thought-out rules, and lovely artwork.